We all had people who impressed us in our lives and who influenced our life choices. 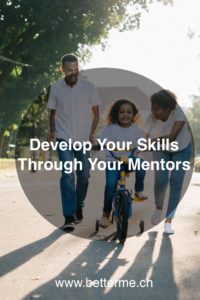 Our parents, or our first attachment figures, usually fill this role in early childhood, but the more we grow, the more the list of our mentors expands. The purpose of this article is to analyse how and why your different mentors have had an impact on your life. This will allow you to find out what basic values you want to follow, as well as the key skills you would like to develop. Take a few minutes to think about the people you especially admire and who have influenced your life. Think of all your family, friends, colleagues, partners, etc and write their name on a sheet. Then, expand your reflection and think of all the people you’ve never met but who influenced you. This can be an actor, philosopher, writer, political character, elite athlete, singer, etc. Build a list from 3 to 5 names. Why are they your mentors? • What are the values represented by this person? • Which of her actions inspired or influenced me? Why? • If I had to speak at the funeral of this person, what would I want the people to remember from his life? What would be written on her tombstone? • If I could acquire one of her qualities, which one would it be? • Are my values aligned with those represented by my mentors? • Are my actions aligned with my values? • If I die today, what would I want people to say about me at my funeral? • What actions can I take to get closer to those of my mentors? What actions should I take to be more aligned with my values? To finish, you can return to the list of your mentors’ qualities that you would like to develop. For each quality, register 3 actions you may undertake to develop it. We all grew up with people we admired, but it’s not always easy to really realize why they have influenced us so much. This simple exercise will allow you to clarify the values and skills/qualities you would like to “borrow” from your mentors, as well as a real action plan to develop them.